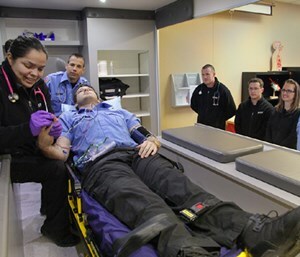 TYLER, Texas — A college’s new ambulance simulator is giving EMS students an opportunity to train in real-life scenarios. Tyler Junior College’s EMS students now have the opportunity to replicate calls with the simulator that lets them train for any type of situation. Prue added that since one side of the simulator is open, students can observe what is going on throughout the exercises. He added that the students start out with basic lessons such as how to lift and carry a stretcher. After the basics, the emergency scenarios are introduced. Instructors simulate the correct response time to the hospital based on the type of simulated situation that they are learning.